There’s one in this town that actually tastes like cinnamon—and we found it. 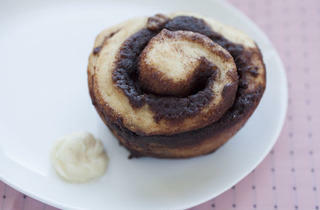 The challenge Find a cinnamon roll that actually tastes like cinnamon. The hunt Crying for help on Twitter was almost useless. Kind strangers replied, but their recommendations only exposed the deep flaws with cinnamon-bun culture in this town. 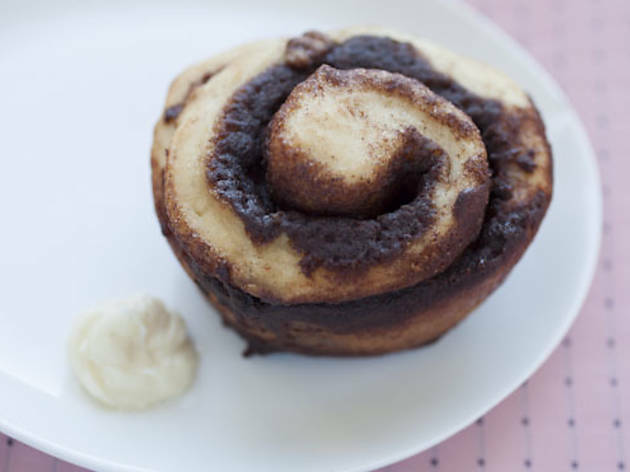 First of all, many of the recs were not for cinnamon rolls at all, but for sticky buns—a completely different pastry (do these people mistake bagels for doughnuts, too?). Secondly, the rolls with the most passionate followings turned out to be not much more than fluffy bombs of white flour and sucrose. These things had nothing going for them: The specimen from Alliance Bakery had slightly staled and showed hints of cinnamon in appearance only; the roll from Specialty’s was bready and slathered with a lifeless icing as thick as mud. The worst offender is perhaps the most inexplicably popular. The cinnamon bun at Ann Sather is oversized, overserved and arrives soaked in a pasty glaze so sweet you wouldn’t be able to taste black pepper through it, let alone cinnamon. Not that they’re putting enough cinnamon in here to really try. Reluctantly, we moved on to riffs and twists on the original. Here, we had some luck. At 2 Sparrows, a flaky biscuit dough (a departure from the traditional yeast-risen) is rolled with cinnamon and topped with a goat-cheese icing. The dough works, but the timid icing doesn’t. Meanwhile, the riff at Trenchermen’s brunch works on every level: The pretzel cinnamon roll is both soft and somehow flaky, with innards that are plastered with thick layers of streusel. You taste cinnamon, you taste salt. It’s delicious, but is it a cinnamon roll? Who cares? The find Well, actually, we care. To name Trenchermen the best would be to admit that no good traditional rolls exist in Chicago. And that’s almost—but luckily not—true. Wandering through a recent Nite Market, we came across Christy Marie’s Cinnamon Rolls, available only by placing a special order with Chris Meyer. We were taken with the rich dough, the nuances of the cream-cheese icing (which has not only tang but plenty of vanilla), and most of all, the rolls’ dark, cavernous swirl of spice. These rolls had everything, but special order them? Could they be worth it? Let’s just say the word special here could not be more apt.